Along a 40-mile stretch of the tidal Rappahannock River between Virginia's Northern Neck and the Middle Peninsula, there is a vision for 20,000-acre system of protected lands. 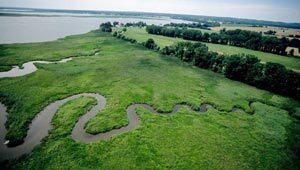 Working with partners such as the Chesapeake Bay Foundation TPL helped establish the Rappahannock River Valley National Wildlife Refuge, and in 1995, acquired a cornerstone property—1,125 acres along Cat Point Creek in Richmond County. The Rappahannock is steeped in Virginia's rich cultural and natural heritage, which the Refuge helps protect while sheltering birds and other wildlife, and offering visitors opportunities to explore thousands of acres of marshes, floodplain farmland, wooded wetlands, and uplands. All told, TPL has conveyed 4,500 acres of land to the U.S. Fish & Wildlife Service to expand the Refuge.